The Amish Queen Anne Sideboard is a top seller at DutchCrafters. The exquisite formal design is graceful and beautiful, with delicate cabriole legs sculpted by hand. Notice the rounded scalloped edges and raised panel doors, all defined by solid wood that shines. Features two cabinets, two drawers and a solid wood surface for showcasing and serving. Custom options include the choice of adding a wine rack instead of the drawers. Which will you choose? 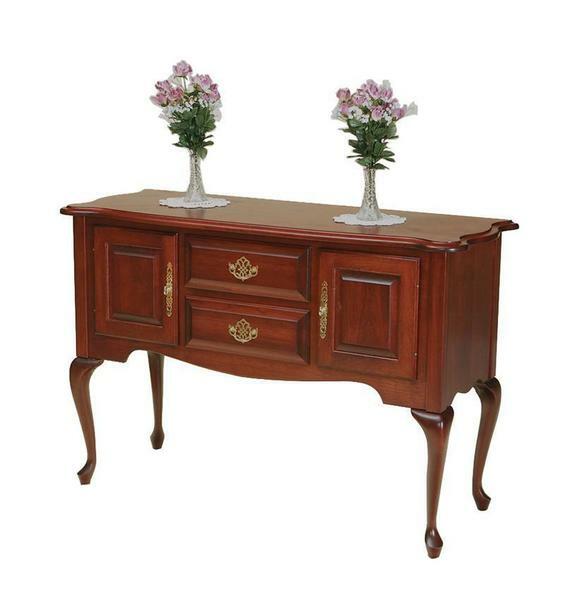 The Amish Queen Anne Sideboard is shown here in cherry wood with classic cherry finish. Always Loved Queen Anne Style? Glad you found us. Our custom furniture can be made to fit your unique style. Our Queen Anne furniture captures the beauty of the period. Amish construction ensures it will last. Please email or call us today with any questions. Thank you for shopping Queen Anne furniture at DutchCrafters. My Mom received her furniture and absolutely loves it! I visited my Mom this past Friday and it was the first time I was able to see the dining room pieces and it was indeed beautiful.